- 2 Masterstouch® Vine Ripe Tomatoes, cut into 3 slices each. - 1/2 cup Parmesan Cheese, grated. - 1 tsp. Dried Oregano. - Olive oil for drizzling over the top. - Parsley for garnish (optional). - Preheat oven to 400º F.
- Place tomatoes cut-side up on a baking sheet. Top with Parmesan, oregano, salt and pepper. 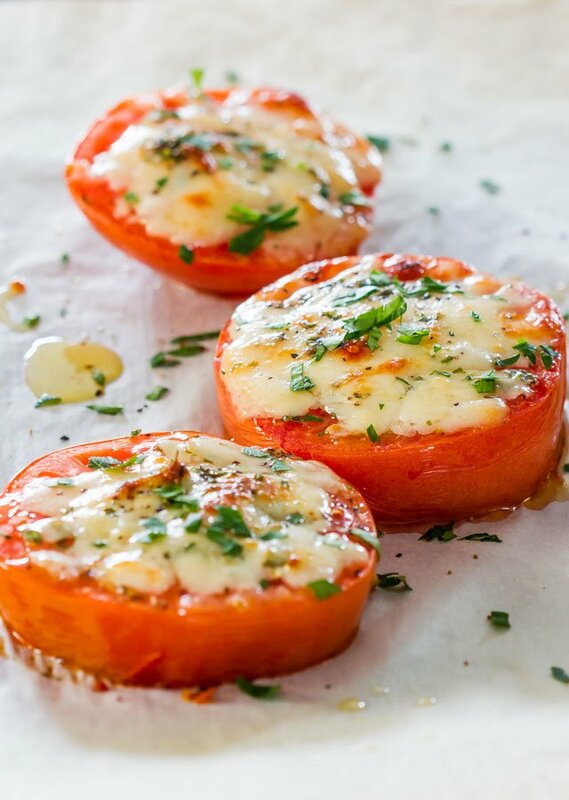 - Drizzle with oil and bake until the tomatoes are tender, about 8- 10 minutes. - Add sliced avocado and parsley for garnish. *Tip: You can also try sandwiching them between slices of your favorite whole-wheat country bread. - 4 skinless Chicken Breasts. - 1 cup Masterstouch® Desert Jewels, halved. - 2 tablespoons olive oil, divided. - 3 large garlic cloves, minced. - 10 large basil leaves, finely chopped. - 8 oz fresh mozzarella, sliced in 1/2 inch thick slices. - Salt and pepper both sides of the chicken breasts and set aside. - In a large sauté pan over medium-high heat, warm 1 tablespoon olive oil. Add chicken, cover pan, and cook for about 8-10 minutes. - Flip chicken breasts and continue cooking until the chicken is cooked thoroughly (or has reached an internal temp of 165°F). - While chicken is cooking, in a medium sauté pan over medium-high heat, warm remaining 1 tablespoon olive oil. Add garlic and cook for about 1 minute, or until fragrant. Add Desert Jewels and continue sautéing until tomatoes skin starts to soften/wrinkle, about 5 minutes. Remove from heat and stir in basil. Set aside. - Once chicken has reached desired doneness, top the tops of each chicken breast with 2 slices of mozzarella. - Pour tomato mixture on top. - Cover pan with lid once more and let the mozzarella melt, about 1-2 minutes. - Lastly, drizzle with a splash of balsamic vinegar and serve immediately. - 1 Cup Masterstouch® Desert Jewels, in quarters. - Seasoning, Salt and Pepper. - Preheat oven to 350 degrees. Slice baguette diagonally into sixteen 1/2-inch-thick slices. - Brush both sides with a total of olive oil. Bake on a baking sheet until golden, about 8 minutes. - Halve avocado lengthwise and remove pit; scoop flesh into a small bowl. Mash with lemon juice; season with salt and ground pepper. - Spread on toasted bread; top with Masterstouch® Desert Jewels. - 4 Large Portobello Caps, Rinsed / Stem Removed. - 8Tbsp. Tomato Sauce . - 10 MastersTouch® Desert Jewels, halved. - 1 MastersTouch® Yellow Bell Pepper Sliced. - 1 Cups Fresh Mozzarella, Shredded. - 1/2 Cup Parmesan, Finely Shredded. - 4oz Fresh Basil Leaves, Chopped (garnish). - 3 Tbsp. Olive Oil. - 1/2 Tsp. Rosemary, Thyme, & Oregano. - Coarse Salt, Granulated Garlic Powder & Cracked Black Peppercorn, to Taste. - Pre-Heat Grill to Medium/High. - In a Mixing Bowl combine shredded Mozzarella & Parmesan. - Brush both sides of Portobello with Olive Oil. - Begin filling Stemmed-side of Portobello with 2tbsp of Tomato Sauce. - Add Shredded Mozzarella/Parmesan Cheese, followed by Grape Tomatoes and Bell Pepper. - Lightly season to taste with Rosemary, Thyme, Oregano, & Garlic. - Place Portobello over HOT Center Grates for 4-6 Minutes, or until Portabello begins to TENDER & Cheese Melts. - Move Portobello to exterior cooler Grates & Grill for additional 4-5 Minutes. - Remove from Grill & allow to rest 2-3 Minutes. - Garnish with Fresh Chopped Basil, Asiago, & Coarse Seasonings. - 2 tsp extra virgin olive oil, divided. - 1 small onion, small diced (about 1 cup). - 1 lb ground beef. - 3 cloves garlic, minced. - 1 can crushed tomato sauce. - ¾ cup shredded mozzarella cheese. - Preheat the oven to 400 degrees. Cut open the spaghetti squash and remove seeds and sinews. Brush the insides with 1 tsp olive oil and sprinkle with salt and pepper. Place, cut side down, on a baking sheet and roast for 50-60 minutes, until golden. Remove from the oven and let cool. - When the spaghetti squash is almost done roasting, heat the remaining 1 tsp of olive oil in a large, oven-safe skillet. Add the onion and season with salt and pepper. Cook, stirring frequently, until softened and beginning to turn golden brown. Push the onions to one side of the pan and add the ground beef. Season with salt and pepper, and cook, breaking apart as you go, until browned. Drain excess fat, if needed. - Combine the onions and beef in the pan and add the garlic. Cook, stirring frequently, until the garlic is fragrant -- about 1-2 minutes. - Stir in the crushed tomatoes. Cover, and let cook for 10 minutes. Taste, and adjust seasoning as needed. - Using a fork, break apart the spaghetti squash into strands. Place in a colander and press to drain. - Add the spaghetti squash to the bolognese sauce. Stir well to combine. Sprinkle with mozzarella cheese. Slide into the oven and cook for an additional 10-15 minutes, until bubbly and the cheese is melted. - Remove from the oven and let cool for about 10 minutes before serving.